Home / Blog / Olive Oil & Plant Uses / More Good News About the Health Benefits of Olive Oil! According to Jewish tradition, the three Sabbath meals (Friday night, Saturday lunch, and Saturday late afternoon) and two holiday meals (one at night and lunch the following day) each begin with two complete loaves of bread. 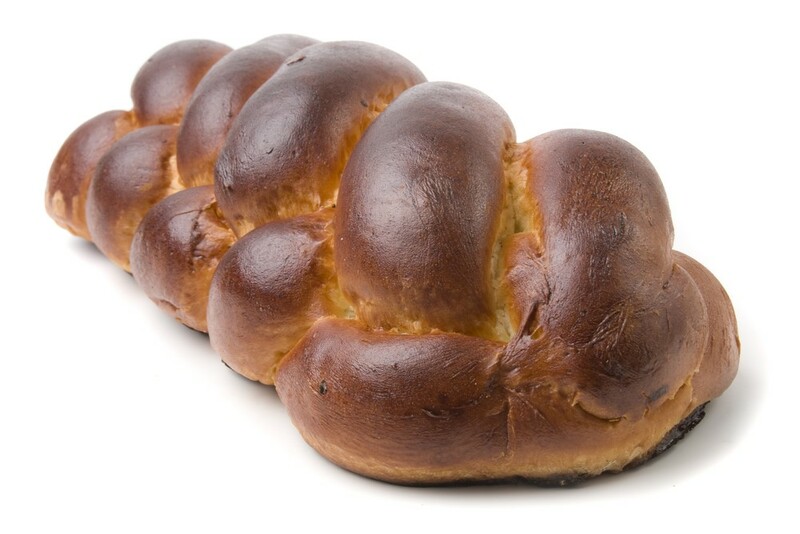 This “double loaf” (in Hebrew: lechem mishneh) commemorates the manna that fell from the heavens when the Israelites wandered in the desert for forty years after the Exodus from Egypt according to Jewish religious belief. The manna did not fall on Sabbath or holidays; instead, a double portion would fall the day before the holiday or sabbath. Each single loaf is sometimes woven with six strands. Together, both loaves have twelve which may represent each tribe of Israel. Other numbers of strands commonly used are three, five and seven. Occasionally twelve are used, referred to as a “Twelve Tribes” challah. This week, a study in the Journal of the American College of Cardiology, by the Harvard Medical School and the Wellness Institute at Cleveland Clinic, found that olive oil does in-fact hold heart-healthy benefits. The study of over 130,000 health professionals found that replacing just 5 percent of saturated fats like those found in butter, with unsaturated fats like those found in olive oil, reduced the risk of heart disease by an impressive 25 percent. This is great news for olive oil fans, however the study cautions that while many people have switched to olive oil, they are still making other unhealthy choices—like loading up on refined carbohydrates and sugars. White bread and potatoes are still not good for you, even if you drench your salad in olive oil. 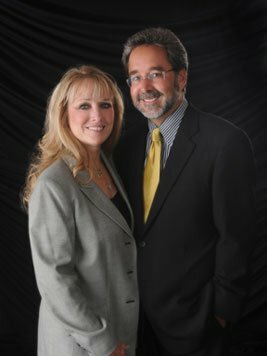 The study advocates eating unsaturated fats and whole grains as part of a heart healthy diet—high whole grain intake was associated with a 10 percent decrease in heart disease. My favorite way to eat heart healthy is with homemade, whole grain bread made with olive oil. And what more appropriate recipe than this delicious whole wheat and olive oil challah bread! The name challah comes from the biblical requirement, hafrashat challah—separating challah. The etymology of the Hebrew root halal is uncertain. It may originally have indicated roundness (“circle”) and then also came to denote hollowness (“space”) or vice versa. 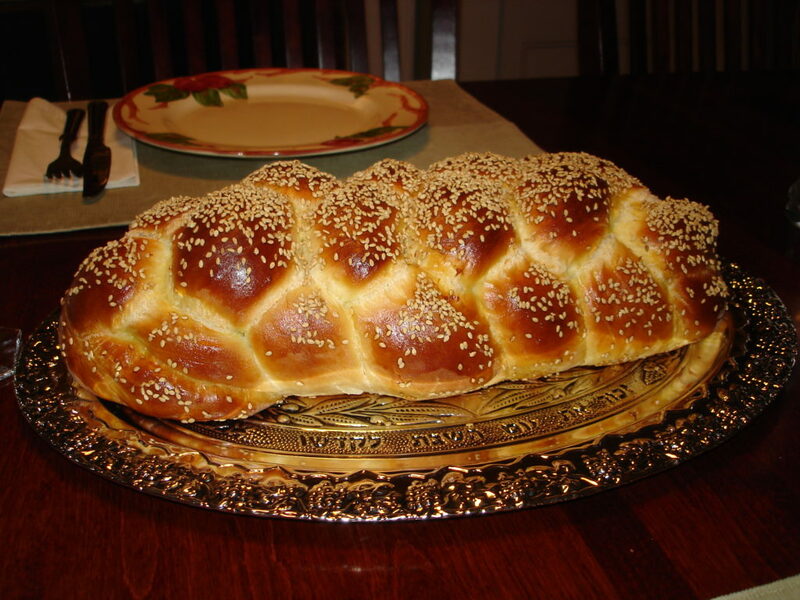 The bread was originally called hallah in Hebrew, since it was baked in the form of a round loaf. It is also now known as cholla bread. Yiddish communities in different regions of Europe called the bread khale, berkhes or barches, bukhte, dacher, kitke, koylatch or koilitsh, or shtritsl. Some of these names are still in use today, such as kitke in South Africa. • Mix the dry ingredients (flour, salt, yeast, and optional vital wheat gluten) together well mixed. • In another bowl, stir together the honey, olive oil, water, eggs—but don’t over mix. • Pour the liquid mixture into the flour mixture, and stir gently until it forms a dough. • On a floured surface knead until smooth and elastic. This should take about 10 minutes. • Gently oil the surface of the dough,cover with a cloth, and let rise about 1 hour, or until doubled. • Punch down the dough, to remove some of the bubbles, and divide into 6 equal pieces. • Starting with 3 pieces on a floured surface, roll each of them into ½ to 1 in ropes. 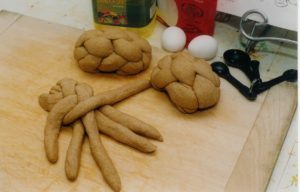 Pinch the tops together and braid them to form a braided loaf. Do the same thing with the remaining 3 pieces so that you have two braided loaves. • Line a baking sheet with parchment and let rise 30 more minutes while your oven is preheating to 350 degrees. • Bake in the preheated oven until golden brown, about 30 minutes. Voila… enjoy your delicious, heart healthy Jewish bread! *Vital wheat gluten is often used when baking with whole grain flour to create bread that is lighter, like its white flour counterpart. If you prefer a denser bread, or don’t have vital wheat gluten lying around, simply omit this ingredient.